My friends outside the US – and I have many – observe our ordeal with a combination of amusement and pity. They don’t like taxes either, and often pay far more than we do. But their governments, for the most part, don’t put people through such torture every year. They appear to have found better ways. Why can’t we? Today we’re going to look at who wins and who loses under the new tax law. I think many of you will be surprised. 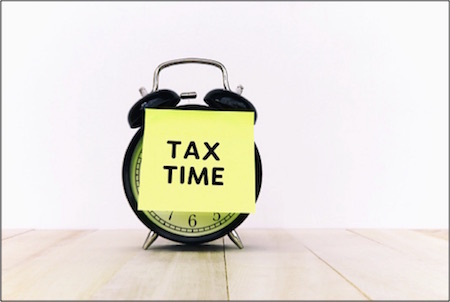 Each year the IRS releases aggregate data on individual income taxes, with a two-year delay. The Tax Foundation helpfully organizes the reports, and in January they released their summary of the data for 2015. We will look at estimates for this year in just a bit. In 2015, 141.2 million taxpayers reported a total of $10.14 trillion in adjusted gross income (AGI). On this amount, they paid $1.45 trillion in taxes, or 14.3%. That’s our collective average tax rate, in other words. But we know averages can be deceiving, and this one certainly is. Most people paid well below that rate, and a small number paid a great deal more. We’ll start at the bottom. The lower half of those 141.2 million tax filers had total AGI of $1.145 trillion, or about 11.3% of all income. On this, they paid $41.1 billion in taxes. Their average tax rate was 3.5%, and they paid 2.8% of all taxes. Note, that’s the lower half of taxpayers – meaning they filed tax returns. There’s a large group below them who didn’t have to file because they had no taxable income. So well over half the population either paid no income tax at all or paid a very low percentage rate. Jealous? You shouldn’t be. Do the math and you’ll see the average AGI for this bottom half of taxpayers was only $16,211. These are not wealthy people. Literally, housing and food and other basics are critical issues for them. Most were employed in some way for at least part of 2015, since they have income, but they didn’t make much. The system is designed to give them a break on taxes, and it worked. At the same time, this income inequality has a frustrating consequence: the other half of taxpayers bear almost the entire burden. 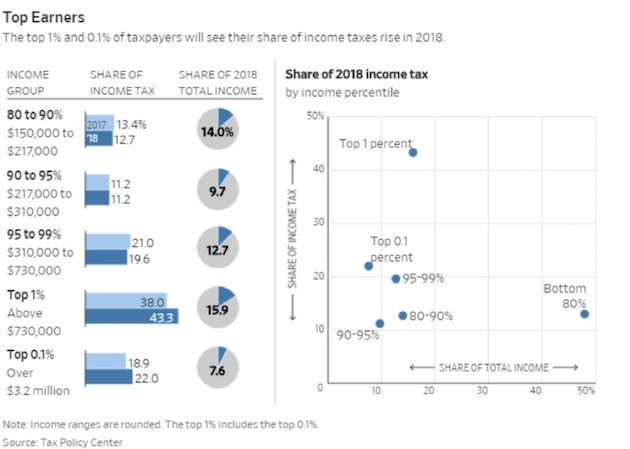 Note that the top 10% pay 70% of income taxes. The top 50% pay 97%. The bottom 50% earn 11.3% of the adjusted gross income and pay 2.8% of the income taxes. The top 50% have 88.7% of the AGI and pay 97.2% of the taxes. That’s why we call the system “progressive.” By design, it gives those at the bottom a lower rate. In fact, it favors more than just that bottom half. 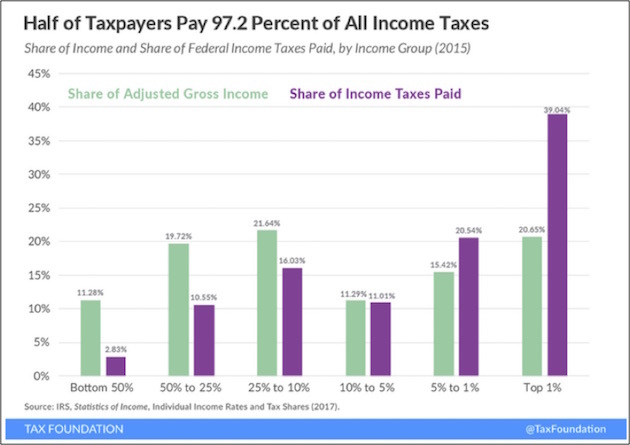 As the chart shows, everyone except the top 5% pays a lower share of the total income taxes than their share of total income. That’s not necessarily true of every taxpayer, since these are averages, but it’s certainly true for most. The top 1%, which we are often told gets wildly favorable treatment, doesn’t look so lucky by this measure. It only received 20.65% of the income but paid almost 40% of the taxes. Let me point out again, this tax structure is not an accident. The tax system is designed to produce this result. The public wants the wealthiest Americans to pay a higher percentage of their income, and they do. Provisions that reduce taxes for the middle and lower classes mean those in the top brackets pay more. Changes in the recent tax bill will make the system even more progressive starting this year. You would never know that if you read the media, which seems to think that the tax bill was a panacea for the rich. Wealthy people in high-tax states will certainly have to pay more. But that’s the responsibility of those state governments, some of which seem intent on driving out their best revenue sources. The results show how steeply progressive the U.S. income tax remains. For 2018, households in the top 20% will have income of about $150,000 or more and 52% of total income, about the same as in 2017. But they will pay about 87% of income taxes, up from about 84% last year. After the income tax, the most important revenue raisers are for social insurance, such as Social Security and Medicare. They will provide about 34% of the total tax take this year, according to the Joint Committee on Taxation. Corporate taxes will account for 7% of revenue, down from 9% in 2017. The rest of the total comes from excise taxes, estate and gift taxes, and other sources such as customs duties. According to Roberton Williams, an income-tax specialist with the Tax Policy Center, the share of taxes paid by the top 5% will rise despite the fact that people in it were the largest beneficiaries of the overhaul’s tax cut, both in dollars and percentages. Why are income taxes negative for the 77 million households in the bottom two tiers, which earn 13% of income? In recent decades Congress has chosen to funnel benefits for lower earners through the income tax rather than other channels such as federal programs. Some of these, such as the earned-income tax credit for the low-income workers, make cash payments to filers who don’t owe income tax. The tax overhaul further lowered the share of income tax for people in these tiers, in part because it nearly doubled the standard deduction and expanded the tax credit for children under the age of 17. People in the lower tiers do owe other federal taxes, such as for Social Security and Medicare. If these tax payments are included, their share of federal taxes paid turns positive. In order to pay for the tax cuts on corporations and the lower income tiers of the country, the Republican Congress had to scramble to find additional sources of revenue in order for the new tax plan not to increase the deficit more than it did. And they found some of that revenue by taking away deductions. There are literally scores of smaller deductions that you were previously able to itemize that will not be available in 2018, or 2019 at the latest. Let’s look at just some of the bigger ones. 1. Everybody knows that state and local income taxes (SALT) will no longer be completely deductible. You will be allowed to deduct only up to $10,000. That is especially painful for people living in states with high income taxes and/or property taxes. And while Texas and other low-tax states don’t have an income tax, local governments are financed by property taxes that are typically higher than those of a lot of states. There are just six states that don’t have an income tax. 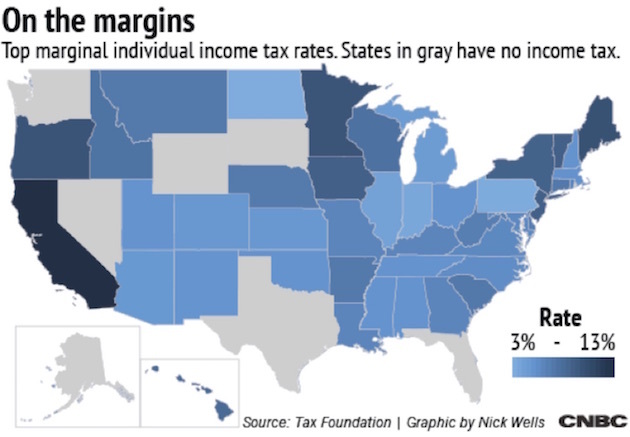 The darker blue your state is in the following chart, the higher your total state income taxes are and the more pain you will feel. 2. Starting in 2018, homeowners can take a mortgage interest deduction on a loan of up to $750,000, down from the current limit of $1 million. When the median home in California is $480,000, a lot of homeowners are going to have mortgages in excess of $750,000. 3. I am not certain what Congress was thinking, but they took away the deduction for personal disaster losses. Now you can take deductions on personal losses if those losses amount to more than 10% of your income. In the future, you can deduct those losses only if the president declares their cause a national disaster. So you would more than likely be able to deduct losses from a hurricane or earthquake, but if your home were destroyed in a flood not associated with a larger disaster, you would not be able to take a deduction for your loss. The same thing goes for a fire. Or for vandalism. This provision makes me wants to throw the yellow flag for piling pain on top of more pain. 4. Today, if you move more than 50 miles for a new job, you can deduct reasonable moving costs. Starting this year you can’t. 6. A Bloomberg article highlights the fact that business deductions for meals may be going away. Yes, corporations get a reduced tax rate, but essentially, the new law says that entertainment expenses are not deductible. Business lunches are entertainment and not deductible. The problem is, there is a great deal of confusion over what might count as a deductible expense. If an expense is considered entertainment, it is not deductible. If you think that change is not going to make a difference in the revenues of high-end restaurants, you’re not paying attention. I don’t think the change affects Chipotle or McDonald’s much – they’re not exactly business-meal destinations. There are always consequences to tax rules, but I think some of the unintended consequences are going to be more painful than people currently think. Corporate accountants are going to strictly limit the ability of their employees to take their clients out to dinner. 7. The Republican Congress has spent a great deal of its time patting itself on the back over the 20% tax break on pass-through tax corporations. The thought was that they were helping small businesses to keep even with the big players who got most of the corporate tax cuts. Well, not so much. It turns out that a lot of us with pass-through corporations don’t qualify, and if you are a modern business with lots of contract labor instead of actual W-2 employees, you don’t qualify either. Why do doctors not get a tax break but architects do? You would think a restaurant owner would qualify. Not necessarily. If you advertise the best pie or steak in your area, you may lose your tax exemption. Seriously. Who writes these rules? This cute infographic from Bloomberg illustrates part of the problem. No one really knows who qualifies for what. 8. Lots of “little” things (unless of course they are your deductions, and then they become big) are no longer deductible. Companies have been able to subsidize commuting and parking expenses and deduct them. No more. And that $20 a month subsidy you got for commuting to work on a bicycle goes away. No more deductions for the commissions you pay your agent or your manager or even for your union dues. Hollywood actors and professional athletes are not going to be happy about that first part. If you’re an actor, you no longer get to deduct your audition travel expenses or acting lessons, either. And while the new tax law nearly doubles the standard deduction for married couples and singles, up to $24,000 and $12,000 respectively, you do lose your personal exemptions. Many families with multiple children will feel that loss of exemptions keenly. I can tell you from personal experience that having more than two kids is expensive. But then again, lower-income families get an enhanced child tax credit. And my personal pet peeve: You can’t buy sporting tickets and give them to clients and claim them as a business expense. I don’t imagine that Mark Cuban and Jerry Jones here in Dallas or any other professional team owner will be happy. That change has got to leave a nasty mark on their corporate sales. And it’s not just professional sports. I have a number of friends who are college sports fanatics, and they had ways to make their ticket purchases a charitable deduction or a business expense. And they loved to use the tickets as a business perk. Now that’s gone, gone. Some people were able to itemize their investment management and consulting fees, tax-preparation fees, unreimbursed employee expenses, and certain hobby expenses. Gone as well. To be fair, there are a number of really good portions of this bill. As noted above, the increase in the personal deductions will mean that fewer people on the lower income scale will pay any taxes at all. Also, the lifetime state tax exemption doubled to $11.2 million for individuals and $22 million for married couples. And with that I’m going to stop talking about taxes, even though I could easily write at least three or four times more than I have, and will probably get back to some of the other details later. There are so many. But I have a personal issue that I want to talk about. 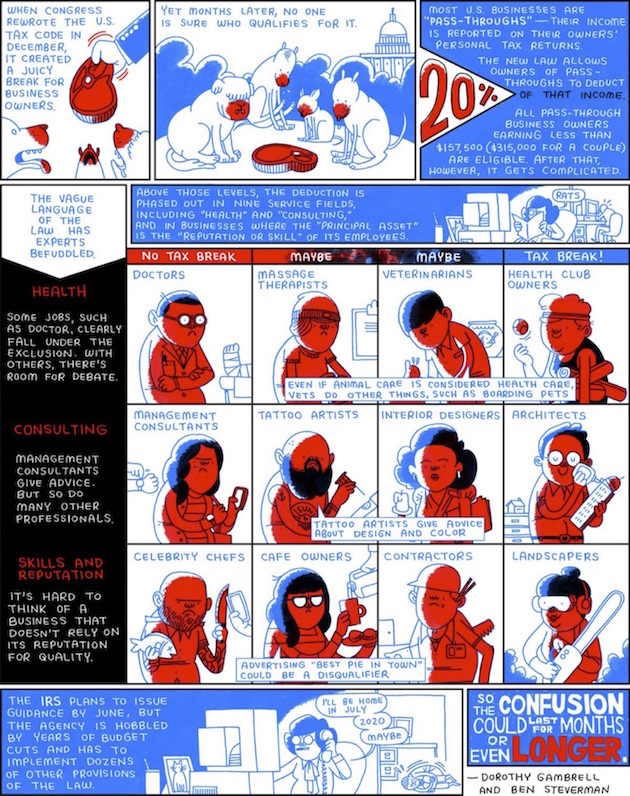 If you have high blood pressure, you might want to skip this. I am going to go in a different direction for a few paragraphs. Personal privilege. This kind of, sort of comes under the heading of economics. Almost any real economist understands that in order to grow an economy you have to increase productivity and/or increase the number of workers. There is no other magic bullet. If your society is not producing enough children, then you need to be bringing in immigrants if you want to see GDP growth. And for a country built on immigration, you would think we in the US would get that – which is why I don’t understand the whole anti-immigration movement. Yes, we need to control the process, and we need to figure out how to attract better-educated and higher-income workers (as Canada is doing), as well as the service workers who make the world go ’round; but we are not dealing with the issues of immigration and illegal immigrants in a rational manner. This fact was brought home to me in a very personal way this afternoon. Warning: This is going to upset nearly every reader – but you will be upset for different reasons. Some of you will more or less agree with me, and some of you will think I’m dead wrong. But either way, we need to make some decisions in this country. This is a personal story. Mary has been working for me for 16 years, cleaning my house, moving me, and doing so many other things. She has become family (as she has with all of her other clients). She’s been in the country for at least 20 years. She is one of the most honest people I know, often bringing me money that I have somehow put in the wrong pocket or drawer. She came to the US a long time ago on a visa, physically lost her visa and her passport, but stayed anyway and began to work. She is married to a US citizen and has three children, the youngest of whom is 10. She pays her taxes like every good citizen. She has been trying to firm up her immigration status for a very long time, and a lawyer finally arranged for her to go back to Juarez to deal with the consulate there, taking along papers from officials here who told her she could simply apply, ask for “forgiveness,” then come back into the US and get her US citizenship. It was supposed to be easy. She found out today that she was turned down. And now she is stuck in Juarez, not the safest of cities. Some bureaucrat at the consulate in Juarez decided that her (US citizen) 10-year-old son doesn’t need his mother, that her (US citizen) husband can live without his wife, and that this sweet, honest taxpaying lady who has never been a problem to anybody in her life shouldn’t be allowed back into the United States for at least a year. Maybe longer. And then she can ask again. No guarantees. This is America? The land of the free and the home of the brave? Is that the business we are in, separating mothers from their young children? And keeping out the very people we need? I know that a number of people are upset about illegal immigration. I totally agree that we need to get a handle on our immigration rules. And our borders. But we need to recognize that there are families in this country who have been here for decades, the Dreamers among them, who are important contributors to our economy. If for some reason they all left, the GDP of this country would simply collapse. I am talking a Great Depression here. They make that much of a difference. And immigrants have made that much of a difference to the US for the last 250 years. Maybe I’m a little bit more sensitive to the situation here in Texas, but we are absolutely used to Hispanics and immigrants of all flavors working, and we never ask if they are illegal or not. There are darned few US citizens who don’t have immigrants in their family histories. But for whatever reason, each generation of immigrants wanted to keep the next group that came out. They were literally trying to build a wall in California in the 1870s to keep the Chinese out. I simply don’t get it. Trump rolled over on the DACA bill, giving the Democrats hundreds of thousands more potential immigrants than they had actually asked for. In doing so he angered a bunch of people in the Republican caucus. And you would have thought the Democrats would be ecstatic. All Trump asked for was a lousy $25 billion to build his wall, a cost that would have been spread out over a number of years. Seems like a reasonable horse trade to me. Now, let me be clear. I think the wall is kind of silly. Will it inconvenience people who are trying to enter the country illegally across our southern border? Absolutely. Do I think that someone who really wants in will not figure out another way? Not a chance. Think Cuba in the ’60s. But $25 billion to settle our most thorny immigration issues? Chump change. A few years ago, in a small, intimate meeting, I really pushed Texas Senator Ted Cruz, who was running for president and touting his anti-immigration line. He knew who I was because we had met before, the first time at his request. We have had long conversations, and honestly, whatever you may think of him, the guy is remarkably brilliant. We have had our disagreements. The host of the dinner put me next to him at the dinner table, and Ted asked me to give him my best shots in the Q&A that would follow the meal. I told him he didn’t want me to do that, but he said, “Bring it on.” Well, I did. After some of the difficult economic questions, which he did pretty well with, I specifically brought up my maid. He gave me glib answers. I was not in the mood to let him go on this one. Okay, I might be a little passionate about it. Every time he tried to dodge the question, I came back and asked, “Senator, do you want to deport my maid?” This went on for some time as I kept interrupting him with this very firm question. When he finally realized I wasn’t going to stop asking in front of a group that he wanted to impress (and get a lot of money from), he said that immigration policy should involve a three-step process. First we should get a handle on who is coming in and control our borders. I totally agree. Second, we should reform the immigration process so that we get more people who are beneficial to the US. I absolutely agree. And then, he said, when those two things are done, “I believe the American people will do the right thing about the illegal immigrants in this country.” Which was basically his admitting that no, he really did not want to deport my maid or any of the other multiple millions of people who are contributing to American society. It was the correct answer, but you basically had to beat him up to get to it, because the issue is so contentious that many of Ted’s constituents around the country just want to say, “Send them back!” By the way, that is not the attitude of his Texas constituency. But you need more than Texas to be elected president. What is it about the American political world today that we can’t have rational compromises? You don’t get everything you want all the time. So work out something in the middle and move on down the road. What we’ve done on immigration is to leave well over a million people (and maybe a lot more) in limbo. America is supposed to be better than this. I am ashamed. It is just another very sad example of how we are broken. Schumer? Pelosi? You should be ashamed. As should all the Republicans who defeated the DACA bills last month in the Senate. Sometimes you have to do what is right for the country. Being worried that you might give Trump a “W” if you compromise is not what I call thinking about the country. The anti-immigration people are simply economically ignorant. We need more immigrants, not fewer. I travel in a few weeks to Fort Lauderdale, then Chicago, then New York and Raleigh for mostly private speaking engagements. I’ve been putting off a trip to New York for too long, and I have too many people I need to see. And finally, just a brief note to those of you who have been asking about the changes that are afoot. I promise that I will let you in on the details very soon. Some of you think I’m building up to a big announcement about the future of this letter; but let me address those questions in one fell swoop: Thoughts from the Frontline is not being put out to pasture! I can promise you that the coming changes are exciting and will benefit both you and me. But rest assured that you will continue to get this letter for free for as long as I can write it. And now it really is time to hit the send button. Have a great week! I think you have hit the nail on the head. Instead of adhering to party rhetoric, Americans need to think for themselves. Why not embrace both DACA and the wall?? One solution for those already here (your maid) and one solution for the people we want to keep out (drug runners, gangs, etc.). In his 2008 book Shattering Orthodoxies, Haag Sherman advocated a similar perspective. Let’s grant retroactive amnesty for those already here…and not spend untold Federal dollars just “rearranging the furniture.” Then, let’s develop a strict, yet fair, process for allowing people from all over the world into our country…provided they can better both themselves and our country at the same time. April 15, 2018, 5:51 p.m. Sorry to say I disagree with you on the cutting of many of the “business” or “entertainment” expenses. I’m glad to see them gone. Every one of those expenses takes money from the treasury, money that comes from the more than 50% of the people you quote as either not making enough money to pay taxes, or from those who scrape by day to day, who can’t go to 5 star restaurants under any circumstances, who can’t pay 7000 for a Super-Bowl ticket, or even standard fare to go to a ballgame. I could even argue that the two martini lunch leaves its participants in no shape to be doing any meaningful “business” at all. One HUGE problem with the US economy and maybe world economy is the disparity of income between rich and poor, and the now two class society we have as being the “privileged” and the “non-privileged. Salaries in most fields are obscene for the work being done, and by getting the poorer people to pay through tax deductions for this bifurcated standard of living is not the way to solve it. Henry Ford tried and did pay his employees enough so that they could all buy their own houses. Run the numbers today and tell us how ridiculous that would be to try today. As to immigration, the tell-tale way to think about it is to listen to those who came here legally from these same countries that now want to come here illegally….the legal immigrants are outraged at the flaunting of the laws, as well as are most hard working citizens who are seeing their country literally stolen from them. As one reader said, alot of us don’t even recognize the country we grew up in. These immigrants refuse to assimilate, get a free ride in healthcare, housing, education , and income. I live in New Hampshire, the government under Obama used to just ship in busloads of immigrants in the middle of the night and sometimes never told the mayors or the governor of the state, and dumped them out by the 100’s. Chris Christie spoke of this during the primaries. And you wonder why the attitudes are the way they are?? The biggest problem is the “Progressives” who under Obama vowed that the country was going to change so that Republicans would never have to even bother to run. They planned to do this by nothing new, it’s a process called Assimilation. They had plans to bring in millions of immigrants, who will of course vote Democrat, and outvote the rest of us in the country. This is exactly why they don’t want anything to do with President Trump’s offer on DACA - they want unlimited immigration. California is the perfect example. And to see how ridiculous our immigration laws are, get a copy of the Mexican or Canadian Immigration laws and see how ridiculous we look compared to their stringent rules. We have stringent rules also but a bunch of bleeding hearts obstructing justice and flaunting the rules is NEVER going to solve the problem. That’s why we’re in this mess in the first place. There’s no way out but to follow the law and suffer the pain until things are straightened out, and then never allow us to get overrun again. Kudos to President Trump for stepping up to the plate and at least trying. Your maid will return, and I doubt she’ll have gone through any more grief than millions of immigrants who left their own countries and families behind during famines, wars, etc. My grandparents came from Sweden under just such circumstances in the early 1900’s, sent to America because their family couldn’t support them. Tough love for a bunch of kids, the oldest being my grandfather at age 16. But if we don’t get our act together, nobody will want to come here eventually, legally or illegally. Ronald Reagan said that if we don’t control our borders we’ll lose our country in a generation…so far he’s right and we’re half a generation into it already. April 15, 2018, 1:34 p.m. Pardon me John. Do you have any Grey Poupon? One problem is that we are deporting individuals in dc6255’s category 1, like John’s maid. There is a lengthy article in today’s Philadelphia Inquirer describing other, similar cases. Why would that be? I suspect that implied quotas on the part of Homeland Security officials may be involved. Are All Illegals the Same ? Last year Kamala Harris, freshman senator from California, was quoted as saying that she knows what crime looks like, and being undocumented is not a crime. Although this kind of statement could possibly come from a non-lawyer, it seems incredulous to have come from a lawyer, until one realizes that this lawyer is a former attorney general of California. By definition those undocumented immigrants living in the U.S. have committed a crime by coming to the U.S. illegally. Now their crime may not be high on America’s Top Forty Crime List, nonetheless it is a crime. Unfortunately, it is statements like this from Senator Harris that makes it harder to think clearly about the illegal immigrant issue, and this hinders any progress toward a potential solution. The major mistake of Senator Harris’ statement is that she has grouped all of the illegal immigrants into one big group. Similarly the mistake that some on the right make is also to group all illegal immigrants into one group. In my opinion this is a big mistake on both sides of this issue, and this tendency to “group” is a major impediment to any solution. Again from my perception, in general, illegal immigrants should be separated initially into three categories, and each of these categories should be dealt with differently. obviously include their immediate families. recipients of some benefits program. by law enforcement in connection with some criminal investigation. In my mind those in category 1 do not need to be dealt with urgently. As long as they are not causing any trouble, I think that they should register and be counted. I realize that there are those who will vociferously object to them registering for a variety of reasons. Why register? There are are multiple reasons why they should register. One is to insure that they won’t be picked up as “innocent bystanders”, and then held in custody by immigration authorities during and after I.C.E. raids. Another reason is to insure that they do not vote, and are not receiving any welfare or benefits, as they are not are citizens. Assuming that they register, and do not slip into category 2 or 3, they stay in category 1 . . . “Live and let live.” I feel bad when these good people are ensnared in the I.C.E. raids which are intended to capture the “criminal element.” Registering would put a stop to that. At some point in the future, those in a category 1 will have to be dealt with on a permanent yet compassionate basis, but really is there any hurry? Those in category 2 will be more difficult to deal with. I realize that a lot of those in category 2 came to this country with the same hopes and aspirations as those in category 1, but as a country we cannot take in and support all of those people from other countries that aspire to live here. If you want to live here, you must earn your own way. My solution for this category of individuals involves a compassionate deadline. Those presently in category 2 must also register, and then they will be given a “free” category 2 pass for one year. During this period of time their benefits will continue, but only for one year. After one year they must either become members of category 1 or they fall into category 3. I find this solution to be both compassionate and fair, and in a perfect world perhaps those in charge will figure out some way to get them jobs. Perhaps a start would be allowing freer flow of water into the Central Valley of California uinstead of allowing millions of gallons of water to flow into the ocean to save some smelt. April 14, 2018, 10:30 p.m. I am now confident that the unknown “black swan” has landed. April 14, 2018, 8:26 p.m. Sorry to hear about your maid’s immigration troubles. Specific to your maid, Mary, if she did enter the US on a visa, she could have adjusted to lawful permanent resident/green card status within the US based on her marriage to a US citizen even if she had overstayed and/or worked without proper work authorization. Leaving the US for her immigrant visa interview at the US Consulate at Ciudad Juarez is only required if she came to the US by “entering without inspection.” But Mary’s situation also demonstrates how hard it is to comply with US immigration law. Being eligible to immigrate is not the same as being able to immigrate, and getting in line is often impossible because no waiting line is available. Based on a change in immigration law in 2001, someone in Mary’s situation who is married to a US citizen can no longer apply for legal status within the US. Rather, a person is Mary’s position must apply at a US embassy or consulate abroad. But under another change in immigration law in 1996, leaving the US triggers a 10-year bar from entry back to the US. With her visa denial, Mary can file a I-601 waiver to get around her 10-year bar based on extreme hardship to her US citizen spouse. By law, hardship to Mary’s 10-year old USC son does not count, but it can be bootstrapped as a hardship to her husband. Again, I’m not sure why an I-601A provisional waiver was not filed before Mary left the US for her visa interview at Ciudad Juarez. With an I-601A waiver, Mary would have known if a waiver of the 10-year bar has been granted before she left for her visa interview outside the US. At this point, Mary’s best option is to file her I-601 extreme hardship waiver and to wait 6 to 12 months outside the US for what hopefully will be a favorable decision. Otherwise, she will have to wait 10 years before being able to return to the US. As a final thought and observation, before the Heller-Celler Immigration and Nationality Act of 1965, immigration admission to the US was primarily reserved for Western and Northern European immigrants, while admission was drastically limited for immigrants from Asia, Africa, the Middle East, and Southern and Eastern Europe. The 1965 Act adopted a more open policy based on an immigrant’s family relationships with US citizens or legal permanent residents and to a lesser degree, their skills. Prioritizing “family unification” over “employability” was based on the premise and belief that it would better preserve the country’s predominantly Anglo-Saxon and European ethnic mix of the country. Instead, by removing the racial and national barriers while maintaining a per-country limit, the 1965 Act began to transform and alter the demographic mix of the US as immigrants from diverse countries in Asia and Latin America established themselves in the US and became the foothold for subsequent family-sponsored immigration. Instead of family reunification, its called chain migration by those who want to reduce legal immigration levels. Therefore, that their ancestors followed the law (which for Western and Northern Europeans basically had an open door to the US) so everyone else should is not an argument that holds water. It’s not even about being against illegal immigration when the political narrative includes reducing the level of legal immigration. I think all or most of us can agree we want good immigrants who can benefit the US. The challenge is who gets to decide which immigrants are good and beneficial to the US. Overall, I agree with Mr. Mauldin that immigration is a positive for the US economically. April 14, 2018, 7:36 p.m.
Thankfully John Mauldin is NOT President. GDP is NOT everything. A community with like interests, values and behaviors is far more beneficial to the average person than some random uptick in GDP. Immigration (yes, legal too) has wrecked many American communities. Polls have shown that a great number of Americans feel like strangers in our own country now. 44% of people living in California don’t speak English at home. 33% don’t in New Jersey. John, you may be able to afford to live far away from what your vision would continue to do to America, but most Americans can’t and they don’t like it as shown by the election of Donald Trump. Taxes and other policies are temporary. People are permanent. Finally, show the evidence that importing millions from the Third World has had an net economic benefit to America. I don’t believe it. April 14, 2018, 6:59 p.m. I believe it is disingenuous to compare relative Federal tax burdens while excluding the effects of of the 6.2% Social Security tax and the 1.45% Medicare tax. The majority of employees will pay the Social Security taxes on their entire wage (or profits in the case of business owners) while earnings in excess of $128,700 are exempt from the tax. The SS tax rate effectively doubles when considering that the matching employer contribution must be paid out of employee’s value to the employer. The Medicare tax escalates at $200,000 from 1.45% to 2.35%. April 14, 2018, 5:07 p.m.
1) Taxes are still ridiculously complex, mainly because politicians keep throwing little “goodies” into the tax acts to please their supporters. I have no idea how to reverse this trend, but when I fill in my tax forms (I’m Canadian, by the way, but the comment and the situation still apply here) I am amazed and appalled by the goofy little deductions I could get for the stupidest things. It will never happen, but I wish some government, some day, would have the gonads to throw the whole mess into the trash can and start fresh. Only three or four tax brackets (I’m completely OK with progressive taxation), almost no deductions beyond the basic flat amount, and low rates all the way up. 2) Throwing Trump a “bone” by way of setting aside some money for a wall would have been asinine, as anyone can see. He is the one that needs to learn to compromise, and the Republicans in the House and the Senate are the only ones that can force him to do so since they have a majority in both places. He has no idea how to actually make politics work, so some bigger brains will have to do it for him. If they can’t and things carry on the way they seem to be, then the GOP could lose their majorities in congress and the whole mess will just grind to a halt until Trump is gone. The Dems are not in control here, and acting as the opposition is pretty much their only job at present.